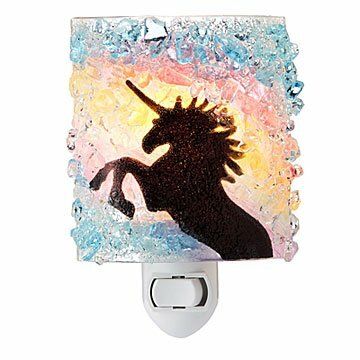 Give bedtime a bit of mythical charm with this recycled glass nightlight starring a sweet unicorn. For a night filled with enchanted dreams you'll want this magical sidekick nearby. Artisans Vawn and Mike Gray handcraft the design from 100% recycled bottles that are crushed, pieced together with meticulous detail, and fused together in an energy-efficient kiln. The result is a luminous piece that fills your room with ambient colors and a bit of mythical charm. It's a playful accent that's bright enough to light your way to the bathroom, but gentle enough to let you snooze. Give the sweet fabled friend to an animal-loving pal or imaginative child. Handmade in Cape Coral, Florida. I love art of recycled materials. This beautiful piece is sure to bring beauty and comfort to my niece's 8 month daughter for years to come. Absolutely beautiful, but I have to remember to turn it on and off. It's not like other night lights that turn on automatically. Maddie loves it!! Bought it for decoration for her room at Grammy's. Great illumination, easy to install and it looks good too.